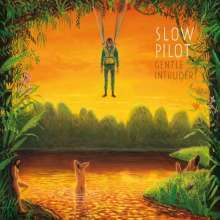 Der Artikel Slow Pilot: Gentle Intruder wurde in den Warenkorb gelegt. Slow Pilot is the band created around singer-guitarist-songwriter Pieter Peirsman, who has been the male vocalist for Hooverphonic for past two years, blowing people's minds all over Europe and appearing on renowned TV shows like Taratata, Europe 1, DWDD, and many more. But Peirsman is also more than just an outstanding vocalist and performer; he is every inch a songwriter, who writes in a recognisable style that unites various musical decades. His songs are warm, sometimes modest, sometimes intense, but always very personal and yet universal at the same time.. Their debut album, Gentle Intruder, was recorded in the ICP Studios in Brussels, and was produced by Jasper Maekelberg (Faces on TV, Warhaus, Amongster, Soldier's Heart, etc.) and mixed by elite producer / engineer Jo Francken. Plus, the Belgian Session Orchestra (16-piece ensemble), under conductor Cedric Murath (Hooverphonic), added string arrangements to five songs.